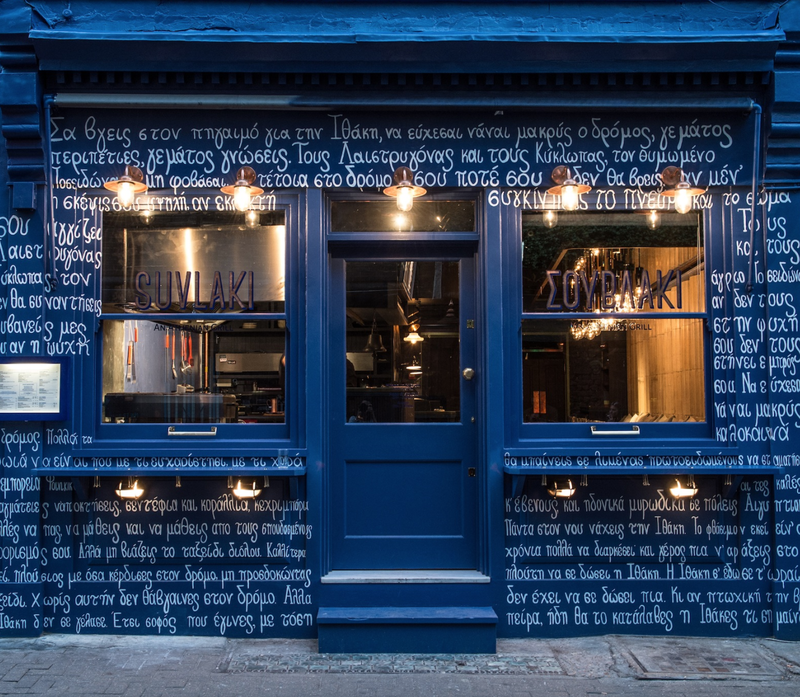 Suvlaki named after the Greek word for little 'skewer' or simply 'stick' is situated in Soho's Bateman Street, this beautiful restaurant is hard to miss with its satirical graffiti on a deep blue exterior complimented by a Greek poem - Ithaca by C.P. Cavafy. Inside, the cosy space is relatively small yet boasts an intimate setting. 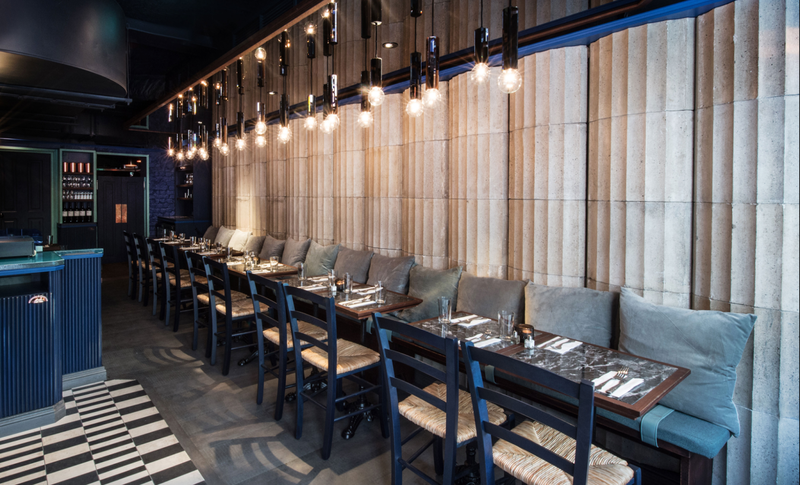 The decor is a mix of petrol blue walls with a hint of turquoise, marble table tops with wood effect, Parthenon-style marble columns line one length of the restaurant accompanied by cushioned benches. On the opposite side of the tables are neatly decked chairs, oversized low lighting hangs from the mirrored ceiling which brightens up the warmth filled space. The kitchen is positioned in plain view, meaning you are able to see the chefs preparing your mouth watering dishes. I visited on a Tuesday afternoon for lunch with my friend Funmi, we were greeted by the co- owner Irene who was very welcoming and seated us by the window. She then offered us something to drink - We both are fans of white wine so, Irene recommended that we try the Alpha Estate Malahuzia wine which was a sweet tasting wine with Rose petal floral aromas and sweet spices, a hint of melon and litchi. Irene also gave us a simple run through of the menu and informed us to gain a good eating experience we should order 4 dishes per person and share amongst ourselves sort of like tapas. 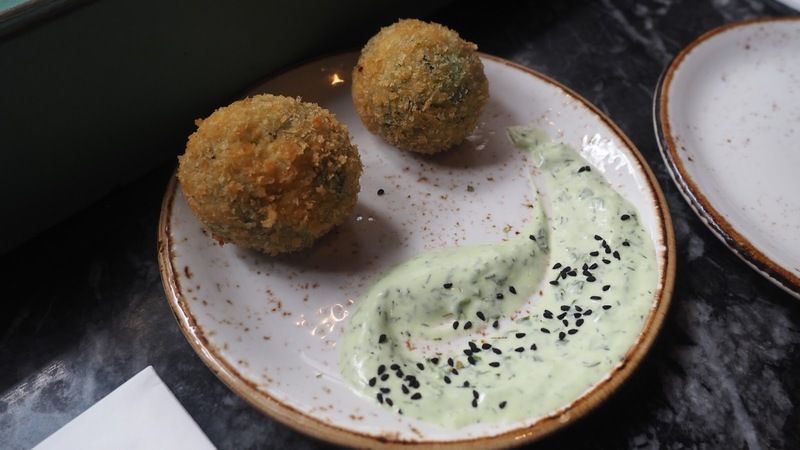 With that in mind, we ordered the following: Prawn Saganaki, Courgette Fritters, Mount Olympus Wild Boar Suvlaki, Pork Kritharaki, Chicken Kebab, Prawn Suvlaki, Greek Salad and Chips. Courgette Fritters - which was very flavoursome packed with grated courgettes, onions, feta cheese, dill and were nicely assembled. 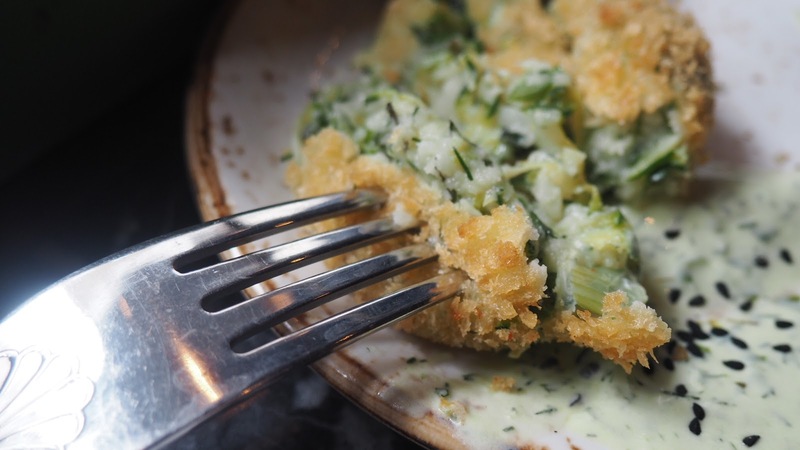 Crispy on the outside and soft on the inside accompanied by a smoked Applewood cheddar and nigella seed dip. Followed by the Prawn Saganaki which was delightful to eat - they were juicy and full of flavour - think of it like a prawn casserole marinated perfectly in white wine, feta, and tomato sauce. 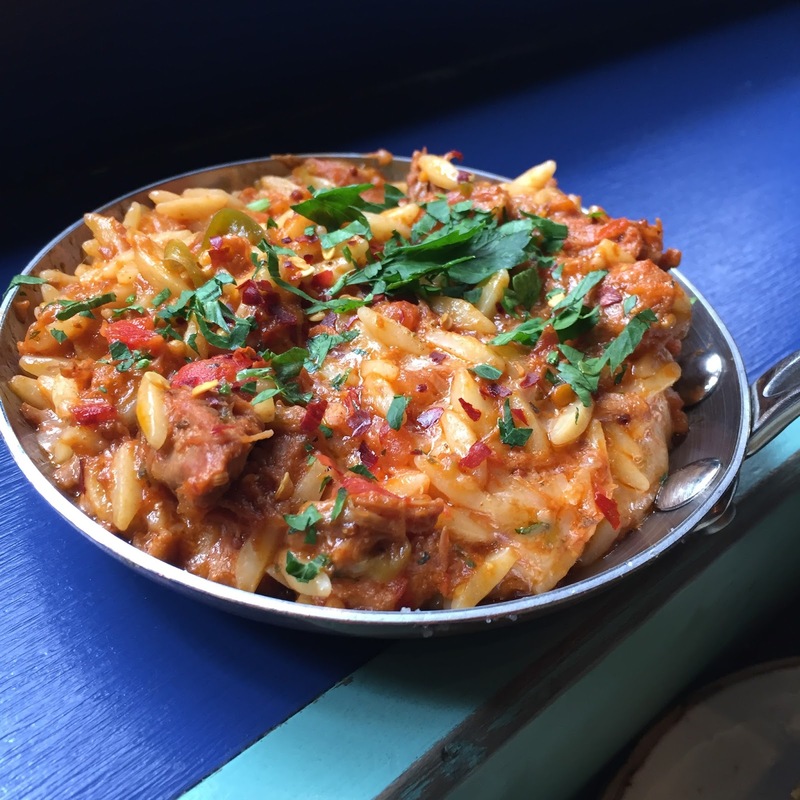 The Pork Kritharaki was a delicious and hearty dish which reminded me of a Paella - the only difference is instead of using rice, Orzo is used which is a form of short cut pasta served in a tomato based stew with plenty of lashings of pulled pork. Next out was the Mount Olympus Wild Boar Sausage which I opted for as a skewer (It can also be served in a pita wrap) This was my first time eating Boar and I was pleasantly surprised how good it tasted! Wild Boar is described as being a lean gamey flavour meat, I would compare it to a Spanish chorizo and it was well seasoned. 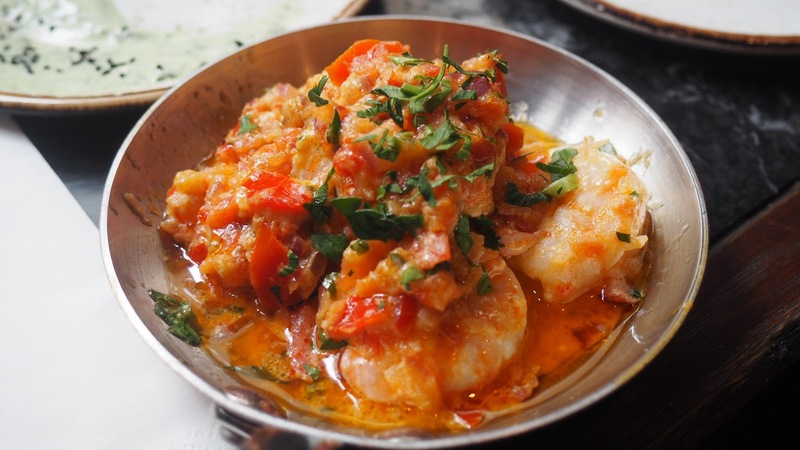 The Prawns Suvlaki were plump and juicy seasoned with chilli flakes, lemon and dill. The Greek Salad as you expect did not disappoint - it was yummy it had loads of tomatoes, crunchy veg and plenty of feta cheese. 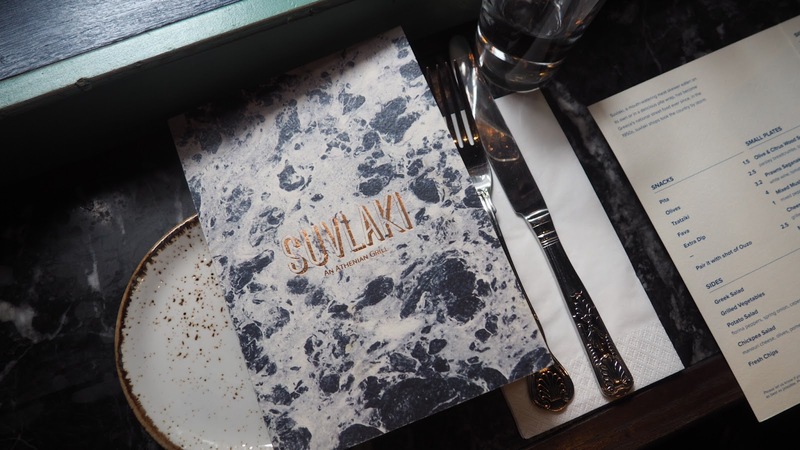 Suvlaki is the perfect spot for lunch and dinner. The menu comprises of simple and authentic flavoursome Greek dishes which are paired with uncomplicated cooking that is perfect for sharing. The staff are friendly and attentive. A second Suvlaki site will be opening its doors in the middle of July in Brick Lane and it is one to watch. *I dined as a guest at Suvlaki. All views and opinions are my own.